Deacon John: New Awakenings - £1,000,000 or something better? You have made it to the last question on Who wants to be a Millionaire, Chris leans forward, "You have £500,000, but we don't want you to leave with that, lets look at the question for £1,000,000. The Catechism of the Catholic Church describes what as the Source and Summit of Christian life? 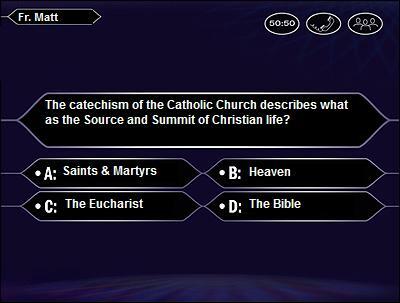 A- Saints & Martyrs, B- Heaven, C- The Eucharist and D-The Bible." This was how Fr. Matt began his homily this morning. Of course the answer is C - The Eucharist. The meal of the last supper made real and represented to us. The taking of Christ's Body & Blood into ourselves, the Source of our Christian strength, the gift that lets us live our Christian lives as Christ would like. A taste of the heavenly banquet that awaits us in heaven with Christ, the high point of our Mass, the summit of our Christian worship and lives, the moment of being at one with Christ. If you won the £1,000,000 prize, you may do lots of good with it, sharing it with friends, family and those in real need. The Eucharist is love and faith and grace, It's Real and It's God, it's Source and Summit, it's beyond measure, it's priceless. After Fr. Matt's passionate and inspiring Homily we sat in silence and then shared the priceless gift of the Eucharist. For those of you who want to read a wonderful, beautiful and detailed Vatican II document about the Source & Summit of Christian life, I really do recommend taking a look at CONSTITUTION ON THE SACRED LITURGY - SACROSANCTUM CONCILIUM I first read it while doing Fr. Michael Fountains course on Liturgy and again during my formation. Don't be put off by the Latin name it been translated into English and is a real insight into our Mass, our Faith and our Christian calling.